some of you may recognize the man below..i took the liberty of making an icon using his image and have posted it quite frequently here on Lj. i clipped this picture from a brochure of an exhibition i viewed nearly 20 years ago, and have had it pinned up in my studio ever since. although his face never left my memory, his name forever escaped me. 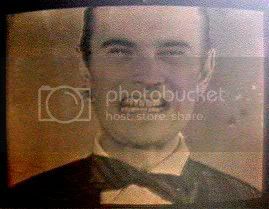 the video installation featuring this distressed, albeit dapper man, contained 17 minutes of footage documenting his attempt to maintain a smile. (don't ask me HOW i remembered the 17 minutes part) the muscles in his face started to twitch, his smile slowly melted away to reveal an expression of obvious discomfort. out of pure nostalgia, i decided to rake the internet in search of information about this exhibition, which i viewed with my best friend, kimmy, and another college buddy, pete, back in the fall of 1987 at the university of iowa museum of art. 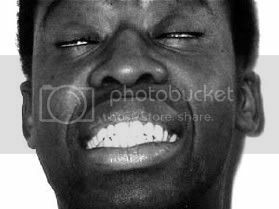 googling words like, 'smile, grimace, artist, video,1987..' brought me unexpected results...one of which provided the man below, artist harold offeh. featured in his 2001 video, entitled 'smile,' he tried to muster a grin for 34 minutes, while accompanied by the nat king cole song of the same title. 'how coincidental,' i thought, wondering if offeh had ever viewed the video i witnessed back in 1987.
christine provided me with a mountain of information...the exhibition, entitled 'video as language,' was originally organized and shown at LACE here in L.A. then travelled to other venues. the footage we viewed, entitled 'ohne titel' ('untitled' in german) was shot by artist rene pulfer and the bow-tied man's name is herbert fritsch, also an artist. all this could've been avoided if i had JUST not scrapped the caption to that damn picture. but, sometimes a good digging uncovers even more information you never knew you needed to know. fun! what an interesting story! and an awesome friend to dig up all that info for you! yah...kimmy's a keeper alright!!! i'd be lost without her...literally. glad i could help you with the vid research! it's fun to throw on the sherlock cap now and then. and in the wise advixe received from my dear tap guru, gene, "Kimberly, have you ever thought about trying the direct approach?" yep. sometimes i do listen and actually learn a little! kimmy holmes and baby watson, at your service!